For all your Pumping & Process Requirements - Pumps, Tanks, Vessels, Pipe Work etc.. 1 DELLMECO AIR DIAPHRAGM PUMP. CAST Aluminium - PTFE, EPDM or Nitrile SEALS - ATEX. Cast Aluminium ATEX Certified with Nitrile diaphragm, valves & seals. Cast Aluminium ATEX Certified with EPDM diaphragm, valves & seals. Cast Aluminium ATEX Certified with PTFE diaphragm, valves & seals. 1 Dellmeco air driven double diaphragm pumps, model DM25/125 (Atex Compliant) with Cast Aluminium, Cast Iron or cast 316 Stainless Steel bodies. Pumps to be supplied with either Nitrile rubber, EPDM rubber diaphragms or solvent resistant PTFE diaphragms, valve balls & seals. Non-wetted black anti-static polyethylene centre body & internal PE air valve assembly (non-stall, no oil design). Connections 1 x 1 BSP female. Maximum free flow on water 125 litres/minute with Nitrile or EPDM diaphragms - 100 litres/minute with PTFE diaphragms. Ideal for chemical transfer, solvents, paint, ink, PVA coatings, diesel, Petrol, filter press, bund emptying, drum & IBC un-loading, plus many other applications. Pumps can also be supplied with filter regulators, trolley assemblies, pipe work installation, tanks/vessels, filters etc. All spare parts & services kits available ex-stock TF Pumps. Maximum capacity Nitrile & EPDM. 125 lpm (33.02 US Gpm). Temperature Limits Nitrile & EPDM. 100 lpm (26.41 US Gpm). We also supply all other spare parts for all types of'Air Driven Double Diaphragm Pumps'. A VAT invoice shall be provided with every order. The item "1 Dellmeco Air Diaphragm PumpAluminium Body-Nitrile-EPDM-PTFE Balls & Seals" is in sale since Monday, June 6, 2016. This item is in the category "Business, Office & Industrial\Hydraulics, Pneumatics, Pumps & Plumbing\Pumps & Pump Accessories\Other Pumps". 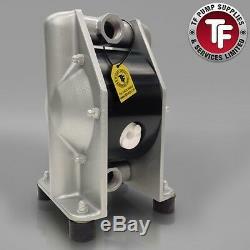 The seller is "tfpumpsdirect" and is located in DERBY. This item can be shipped to United Kingdom.